The real reason cyclists love green-painted bike lanes so much is simple: They send the clearest-possible message that roads are not only for cars. Despite a century of sharing roads, and despite the fact that people walked and biked in streets long before cars came along, there’s a strong mentality among entitled drivers that roads are for cars. A five-second Google search turns up plenty of examples. 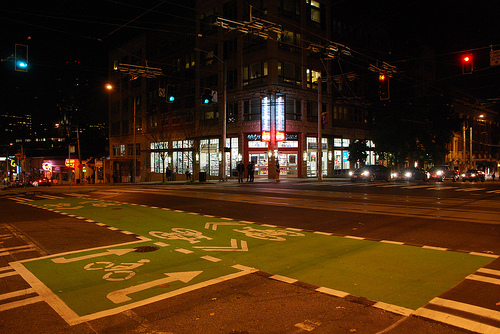 Green-painted bike lanes accomplish what a white stripe next to the parking lane cannot. They proclaim loudly and clearly that streets are not merely sewers for car traffic, but fully multimodal public spaces. They send the message that drivers are welcome to use roads just like everyone else, but must not expect to have roads completely to themselves. Elsewhere on the Network today: Peninsula Transportation Alternatives puts the controversy around San Francisco’s Google buses in context. ATLUrbanist, riffing off a Slate article, discusses how greater Atlanta’s unwalkable development harms people’s health. And Strong Towns says we need “schools on safe routes” more than safe routes to unwalkable schools.